A shocking, yet deeply meaningful look at child soldiers in Africa tops the list of 2015. Easily one of the best films of 2015, Cary Joji Fukunaga’s Beast of No Nation delivers a compelling narrative that moves us emotionally while it shocks us with reality. Unlike most studio offerings of last year, this Netflix indie reminds everyone of the importance of story in cinema. Complete narratives do more than simply satisfy a laundry list of suggested story points—they provide meaning to the seemingly meaningless. Through Main Character Agu (Abraham Attah) we experience what it feels like to live, fight, and kill as a child soldier in Africa.1 The things we have to do and the sights and sounds we need to experience provide the intimate look at this conflict—a necessary point-of-view when crafting a complete narrative. Forever underestimated, Agu rises to the occasion and fulfills the expectations of his leaders and his fellow child soldiers (Main Character Throughline of Activity, Main Character Concern of Doing, Main Character Issue of Experience, Main Character Problem of Non-Accurate, Main Character Response of Expectation). Through Influence Character Commandant (Idris Elba) we see the impact manipulative adults have on immature minds. The Commandant does this by taking on the role of a great military leader, thinking himself more powerful and more important than he truly is. While he possesses a drive and a presence unlike most others, it is his carnal and base desires that have the greatest effect on the young boys. Always looking forward to the next bridge, the next city, and the next conquest the Commandant sees his work with these influential minds as merely a means to an end—an end that sees him in a position of great power. He ultimately fails to get results, leading him to promise Agu that he will call upon him again (Influence Character Throughline of Manipulation, Influence Character Concern of Playing a Role, Influence Character Issue of Desire, Influence Character Problem of Process, Influence Character Solution of Result). As important as the first two, yet often unexplored in most modern film, is the Relationship Throughline between the Main and Influence Character. Here we experience the conflict that arises from a sort-of hero worship that exists between Agu and the Commandant. Agu clearly sees the Commandant as a potential father figure, and this error in judgment fuels their interplay. The Commandant begins their affair with his initial assessment of Agu’s value to their company: while everyone else sees a boy, the Commandant sees a soldier with hands to pull a trigger. More misjudgment, more errors. Their interactions ultimately prove that a relationship built on lies and misunderstandings can only lead to dissolution and disappointment (Relationship Story Throughline of Fixed Attitude, Relationship Story Throughline of Impulsive Responses, Relationship Story Problem of Non-Accurate). Finally we have the fourth and final Throughline, the Overall Story Throughline. Here we witness objectively the horrors of a people locked in revolutionary war, a constant battle of two steps forward, one step back. The idea of children fighting as soldiers to protect their families and their homes is an intolerable one, but one that nevertheless renders the fire of conflict here. Seeing themselves as young and unproven, the children fight for the honor of going into battle with the Commandant and the opportunity to prove themselves worthy. (Overall Story Throughline of Situation, Overall Story Throughline of How Things are Changing, Overall Story Problem of Non-Accurate, Overall Story Symptom of Unproven, Overall Story Response of Proven). 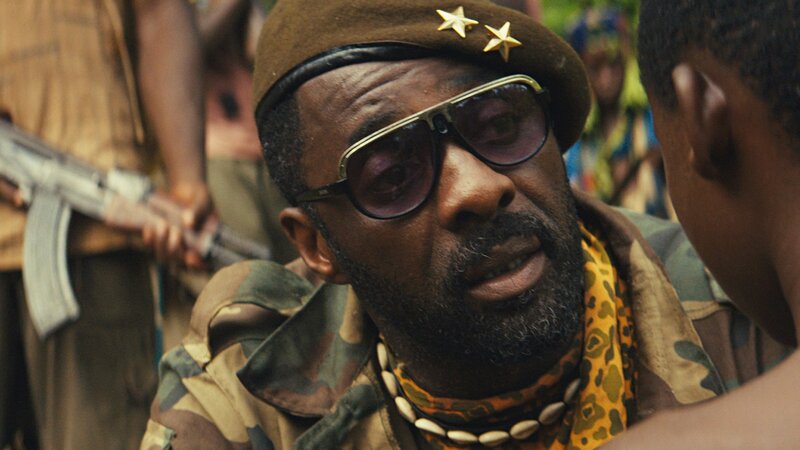 Beasts of No Nation grants us a rare insight into an intolerable situation. But it does more than simply tell us what is going on—it provides a context for us to better understand what is truly going on—and offers a potential solution. Agu finds his peace with his own accurate assessment of himself as a beast. He slips into the ocean as a means of cleansing himself of his sins. For the Overall Story Throughline—that Throughline that concerns everyone involved in the conflict—for that storyline to find an equal amount of resolution it too must make an accurate assessment of itself in order to see true progress made. Until that time, the people caught up in the conflict will continue to find themselves dragged down into the abyss of a life lived reactively—a life lived like animals fighting for survival. (Main Character Solution of Accurate, Story Judgment of Good, Overall Story Solution of Accurate, Story Outcome of Failure, Story Consequence of Impulsive Responses). The image above is taken from the Story Engine window of Dramatica Story Expert. Story points in BLUE represent choices made by the user. Story points in RED reflect implied story elements provided by Dramatica.